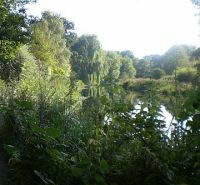 After enjoying a picnic in the surrounding grounds we set out for St Cross a mile or so away in the water meadows alongside the River Itchen. Lesley says the walk takes approximately 50- 60 minutes there. Please ask if everyone is happy to walk by very contented cattle as an alternative route where cattle often graze is available. The walk to St. Cross includes the new KEATS WALK, where the English Romantic poet frequently walked in 1819 and subsequently penned his ode “To Autumn”. 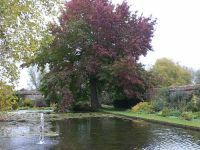 St. Cross Hospital (as in hospitality) has stunning grounds and ancient fish ponds. 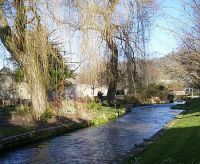 They really are well worth a visit especially on a sunny day. At the time of writing fees are £5 adult, £4.50 senior/student. St Cross closes at 5pm during summer months. We plan to have a meal together in the evening at ‘The Old Gaolhouse’ a JD Wetherspoons address 11a Jewry Street, Winchester SO23 8RZ around 6pm. However do bear in mind that some people may not stay for the meal so please contact us before the day if you intend to just come for the evening meal. 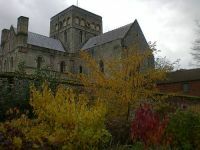 The Hospital of St Cross and Almshouse of Noble Poverty is a medieval almshouse in Winchester can be seen from St Catherine’s Hill. 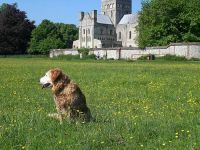 Renowned for the tranquility of its setting and the beauty of its architecture, the Hospital is the oldest surviving charitable institution in the United Kingdom. The Grade I listed building was founded by Henry of Blois, Bishop of Winchester, grandson of William the Conqueror and younger brother to King Stephen in 1136. The octagonal chimneys mark the Brethren´s lodgings, built about 1445. Apart from providing for the Brethren, Almsgiving is still practised in the form of the `Wayfarers Dole´. A piece of white bread and a cup of good beer or Ale may be obtained by knocking at the door of the Porters Lodge, and requesting the Dole! The Hospital still provides accommodation for a total of 25 elderly men, known as “The Brothers”, under the care of “The Master”. The building is constructed of stone and surrounds two quadrangles. The smaller Outer Quadrangle to the north consists of: the outer gate (16th century); the brewhouse (14th century). The guest wing, kitchen, the porter’s lodge are from the 15th century and the three-storey Beaufort Tower of c. 1450. 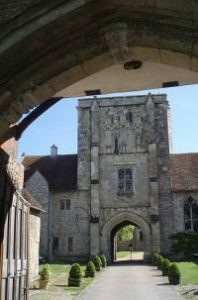 This has three niches above the arch, one of which still contains the weathered statue of Cardinal Beaufort, who was Bishop of Winchester, and the tower and spaces above the porter’s lodge used to be the Master’s lodging. Passing beneath the tower, the Inner Quadrangle is reached. The north range includes the 14th-century Brethren’s Hall entered via a flight of steps in a stone porch. There is a timber screen with gallery above which has an arch braced timber roof; a central hearth and a dais where the Master dined with the Brethren. A wooden staircase leads to the Master’s rooms in the south-east corner. The Master’s Garden includes a wide range of plants with flowering interest throughout the year. The borders are very colourful in the summer months, with shades that are particularly sensitive to the historic location and grey garden walls. The garden includes a border planted to celebrate the Queen’s Golden Jubilee in 2002. Should the weather be inclement we will still meet at the Guildhall ‘eighteen71 café’ at 12.15pm. 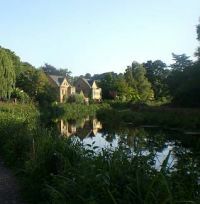 Places we might visit: National Trust City Mill (fees), Westgate Museum and some military museums (free). Walk to Great Hall (entrance fees) etc. Winchester Discovery centre/library- mainly free. A mobile contact will be given to those who have told us that they will be joining us. Car parking Info at time of writing. Please see relelvant websites for up-to date information on the day. Barfields 1309 Romsey Rd, Winchester SO22 5SL and St Catherines Garnier Rd, Winchester SO23 9BN. One P&R ticket covers one car and its occupants for parking and travel for the whole day at a maximum cost of just £3. The Park and Ride (P&R) buses run from 06.55 to 18.51 on Saturdays. The last buses back from town to the car parks run at approximately 18.30 on a Saturday. The Car parks remain open 24/7 although overnight parking is not permitted. Arrangements can be made on the day to get people back to their cars after the meal. Lifts work 8.30- 17.45 only. Winchester Railway station car park has a flat rate £8. There is no booking fee for this event.